I’m always fascinated by other people’s birth stories, it amazes me how different everyone’s experience can be, even for the same parents. This second time mum told me about how her daughter made her appearance. How do you know you’re in labour? Don’t worry you’ll know, or so they tell you. You’ve seen the films; screaming, shouting, swearing and husbands with broken bones in their hands from being squeezed so hard. My first baby was induced (after 35 weeks when my waters broke at 34 weeks and there were no contractions ) so I knew the chemically induced contractions hurt, really hurt. I had had an epidural, so I had no idea what to really expect with my second birth. I was just excited to have made it into my official maternity leave! On Tuesday I had one Braxton Hicks moment and I was excited that things might be happening and again some more Braxton Hick, or practice contractions, on Wednesday afternoon, but then it stopped. On Thursday (one week before the ‘official’ due date) I was getting regular pains and after endless Googling of ‘how can you tell if they are real contractions’ I concluded they were Braxton Hicks – they were uncomfortable and painful sure but I wasn’t shouting and swearing; they weren’t getting stronger or more painful. I could look after my toddler and read stories, be his personal climbing frame, and talk through the pain. After lunch I thought ‘maybe I ought to ring’ but I wasn’t convinced. Could I convince a midwife of the need to do anything – midwives say they can hear it in your voice and it didn’t feel imminent or like real contractions. My husband, determined to help, suggested I was a wuss with pain so I took two paracetamol and carried on! That afternoon we had a Messy Church, craft afternoon, at the church hall. My toddler was covered in glitter and so was I. We were sitting on the floor painting, doing craft activities, and chatting with other families. I began to feel increasingly uncomfortable and was gently teased, during the communal tea, that as glitter is hard to get off, I could end up going to the delivery ward still covered in it. As everyone was leaving, I had a bloody show and my waters broke. Concerned I talked to my husband. Ring the hospital was the reply. As I was on the phone to the midwife I said ‘I need to push’ and I could suddenly feel what I knew to be the baby’s head pushing down. She said you don’t need us you need an ambulance – great reassurance. A friend looked after my son in another room. My Husband called the ambulance and they asked a series of questions to ensure I didn’t have Ebola or meningitis – a frank exchange suggested that more urgent advice was required! I had to stop and say ‘take down my tights the baby’s coming’. 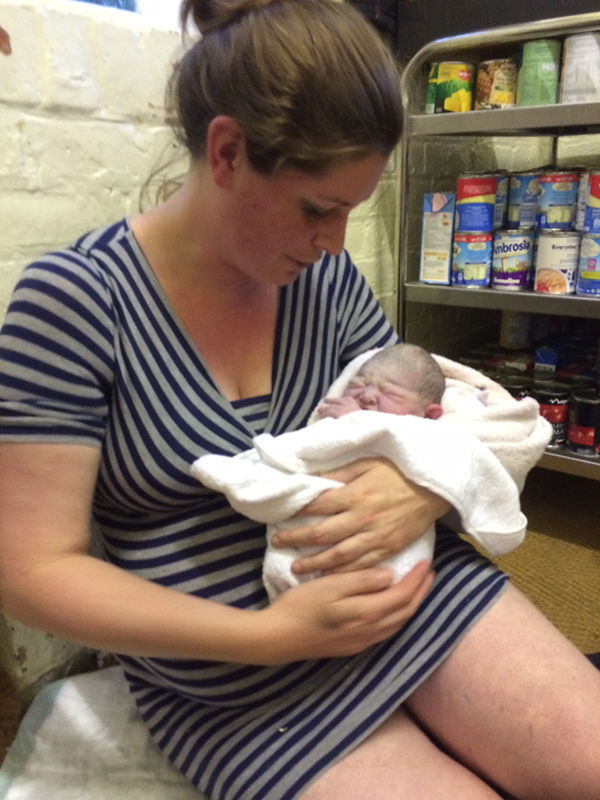 With two pushes my baby was born caught by my husband in a side room in the church hall. Moments later the church warden (a trained midwife who had not delivered a baby in 50 years) arrived with towels and ensured the cord was clear of the baby’s neck. I looked to see if it was a girl or boy and seeing the cord initially thought it was a boy but she was a girl. (This shocked me almost as much as her arrival as my pregnancy was so similar to my first that I was convinced it was another boy). A first responder arrived and helped cut the cord and the ambulance arrived five minutes later. My son came to meet his new baby sister as if it was the most natural thing in the world for mummy to have had the baby just like that. We were taken to the hospital to make sure everything was fine and my husband was welcomed onto the maternity ward as a honorary midwife. My daughter slept for most of her first day which is common with quick deliveries. ‘Weren’t you frightened?’ is the first thing people ask, and genuinely I wasn’t as soon as I could feel the baby’s head coming. It sounds a cliche but there was no time for fear or to think about it, and it reminds you that birth is a very natural process and your body knows what it is doing and how to do it. The church hall address is on her birth certificate and it will always be her special story of how her daddy was the first one to ever hold her and delivered her. 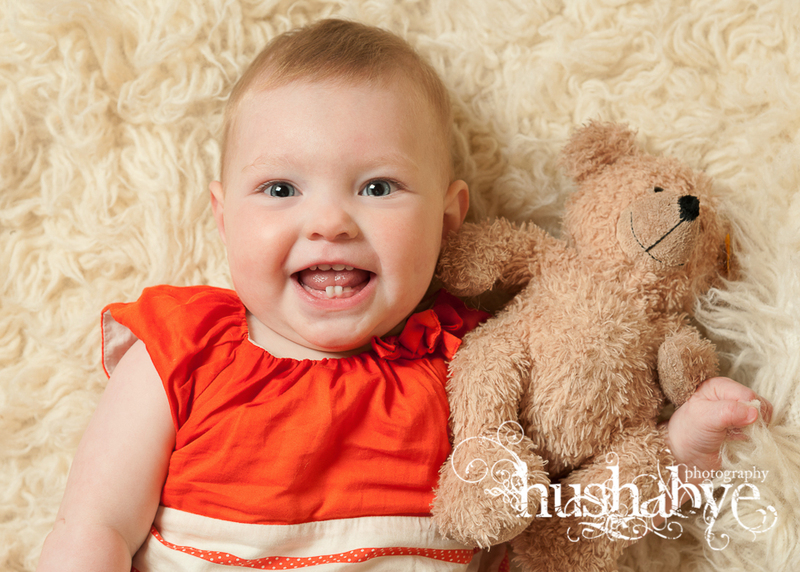 She is now nine months old and has just learnt to clap which she is very proud of – another very natural process. I’m sure you’ll agree, this gorgeous girl doesn’t seem to have suffered from her experience! If you have an amazing birth story, I’d love to hear it.